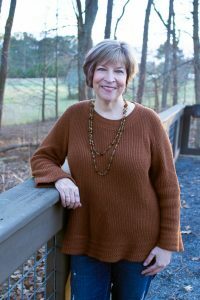 While I was on tour in North Carolina, I stayed with fellow artist and dear friend Marlowe Carruth at her beautiful home in Raleigh. A lot of folks don’t know that I lived in the city of Raleigh from 1985 until 1993; my two oldest children were born there. But I hadn’t visited over the course of the 25 years that have passed since then; so much has changed that I hardly recognized the place. Marlowe was kind enough to show me around and answer endless questions. 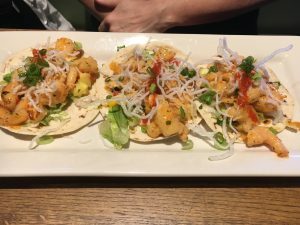 My favorite restaurant from back in the day, Rock-Ola Cafe, is closed but Marlowe introduced me to several of her favorite new places, including the Salt & Lime Cabo Grill. We started our lunch with some chips, salsa and homemade guacamole – fire roasted tomato and goat cheese and pineapple-jalapeno. The flavor combinations were amazing; I just kept going back and forth between the two trying to decide which one I liked best. In the end, it was a complete toss-up. 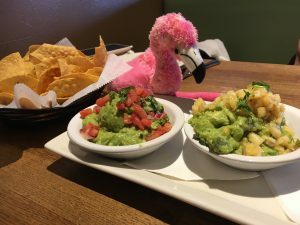 Pinky the flamingo likes guacamole too! 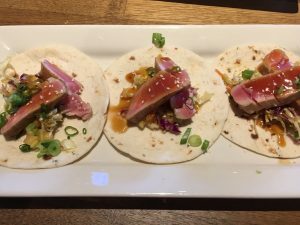 and the blackened seared tuna tacos – grilled flour tortillas topped with yellowfin tuna, lime cilantro slaw, soy glaze, pineapple-jalapeno salsa, wasabi cream sauce and sesame seeds. We asked for extra plates so we could share. Don’t these two make a handsome pair? 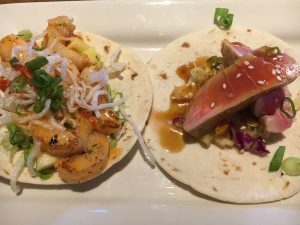 I’ll have to try to the barbecue mahi tacos – blackened mahi-mahi, cabo slaw, house barbecue, pico de gallo, guacamole, lime cream sauce and cilantro – and the classic fish tacos – Dos Equis battered haddock, salsa verde, napa mix, pickled radishes, lime cream sauce, pico de gallo, and cilantro – next time. Oh, yes – there WILL be a next time! Thanks, Marlowe for going on a fish taco adventure with me!